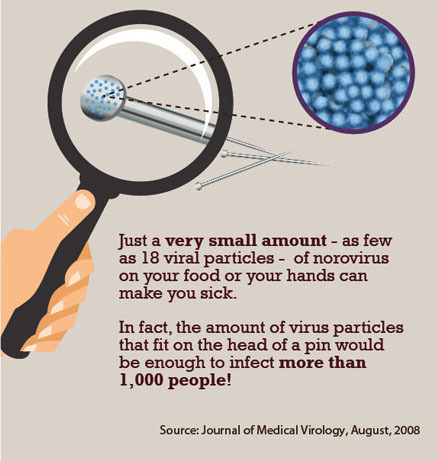 The June issue of the CDC’s Vital Signs discusses the disturbing fact, that when it comes to norovirus: “…the amount of virus particles that fit on the head of a pin would be enough to infect more than 1000 people.” Not only that, but this tough contender can withstand freezing, as well as temperatures up to 140˚F; it causes 19-21 million illnesses in the United States alone; and it holds the championship belt for being the “most common cause of foodborne-disease outbreaks in the United States”! However, norovirus does not have to prevail this winter (a time when the illness frequently shows up). One simple, but very effective treatment is out there that can limit the spread of norovirus: hand-washing. Though it may be common knowledge for folks working in the food industry, it’s good for us to take a step back and remind ourselves of the significant responsibility we play in preventing the spread of norovirus. A massive 70% of contaminated (norovirus) food outbreaks are caused by infected food workers. With the virus’s ability to live and thrive in numerous environments, hand-washing is our best way to say “no” to norovirus all year long. …and Nelson-Jameson is here to do our part! That’s why we have compiled a wide line of hand hygiene products meant to take on the challenge. Our selection of soaps, signage, hand dryers, and towels are there to assist in the struggle to contain this formidable opponent. We even offer Glo-Germ products, meant to help in training/demonstrating proper hand-washing techniques to employees. Call us for more information or to get a copy of our “Hand Hygiene Products” catalog. To check out more about the importance of hand-washing, check out this site from the CDC concerning how “Clean Hands Save Lives,” or our Learning Center article on Hand Hygiene.